In the 1970s and 1980s, research from a division of NOAA's Montlake Lab suddenly and irreversibly changed the way scientists and the public viewed the health of Puget Sound. Their discoveries of industrial toxics in the region's sediment-dwelling fish led to the creation of two Superfund sites, and new approaches to ecosystem management across the Sound. The man at the forefront of this research was Dr. Donald Malins, featured here as part of the Puget Sound Voices series. 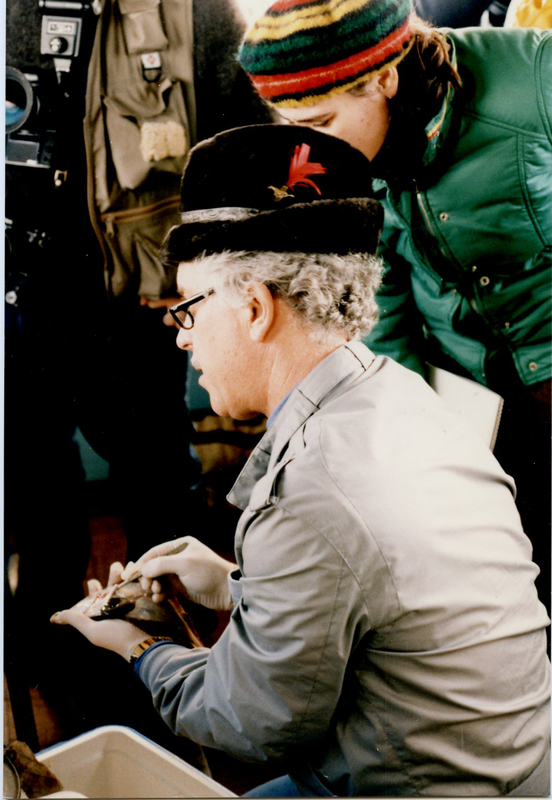 Don Malins examines a fish during a research trip to the Duwamish estuary. Photo circa 1987. Photographer unknown. Puget Sound residents have always liked to think of this region as being more pristine than the waters along the U.S. East and Gulf Coasts. But locals received a rude awakening beginning in the mid-1970s and continuing to this day. Studies of water and sediment quality by various scientists at that time revealed the presence of fin rot, liver tumors, and other maladies in fish living on the bottom of Puget Sound, notably at the mouth of Seattle’s Duwamish River. As these findings emerged, Dr. Donald Malins was the leader of a new multidisciplinary research program that would investigate the extent and causes of these problems. Their goal was to establish valid statistical relationships between water and sediment chemistry and any associated biological effects. This approach was vital for providing a credible basis for any state and/or federal corrective action. Malins was the newly appointed Director of the Environmental Conservation Division of the Northwest And Alaska Fisheries Center (popularly known as the “Montlake Lab” for its location adjacent to the Lake Washington Ship Canal in Seattle). This federal agency was a unit of the National Marine Fisheries Service, National Oceanic and Atmospheric Administration (NOAA). Over the next decade and beyond, Malins, his colleagues, and other researchers found similar problems among sediments and fish in the urbanized estuaries throughout the Sound, including Tacoma, Bremerton, and Everett. They found few such problems in sparsely populated and non-industrial areas of the Sound. As part of the Puget Sound Voices series, geochemist Randy Shuman and oceanographer Richard Strickland have been interviewing some of the pioneers and explorers who have been influential in Puget Sound ecosystem science. "Discovery of tumors in fish"
Through a series of carefully planned studies published in peer-reviewed journals, Malins and his co-workers established a relationship between the fish pathologies and certain toxic chemicals in the sediments. These chemicals included heavy metals, polycyclic aromatic hydrocarbons (PAHs, by-products of petroleum use and combustion) and PCBs (commonly used as additives for electrical insulating materials and banned for production in the U.S. in 1979). They used English Sole, a flatfish that lives in contact with sediments in estuaries, as an indicator organism, but they also studied the incidence of toxic chemicals and abnormalities in a wider range of marine life. As scientists documented that parts of the Sound had elevated levels of toxic chemicals in the sediments, articles began appearing in newspapers and other media. There was an outcry among the public, the media, corporations, and the government. Scary headlines appeared frequently in local and national newspapers, invoking possible threats to humans eating fish and shellfish from these areas. Reporters hounded Dr. Malins for the latest news. Government officials at various levels ran for cover or sought the spotlight to capitalize on the revelations. No one was able to discourage the scientists from pursuing their work, however, and no one was able to debunk any of their findings. Dr. Malins was well suited to play this role, having studied chemistry in college and earned both Ph.D. and D.Sc. degrees in lipid biochemistry from the University of Aberdeen, Scotland, the latter while on leave from the Montlake lab. Many of the toxic chemicals he found at the bottom of Puget Sound have an affinity for accumulating in lipids (fats and oils) in the bodies of fish and other animals. Toxins often build up in those tissues and are passed up the food chain from lowly worms to fishes and then to higher organisms, such as birds and whales. The work performed under Dr. Malins’ supervision fundamentally altered the course of marine science and marine resource management in Puget Sound. Over the next decades, both the Puyallup River estuary in Tacoma and the Duwamish estuary in Seattle would be designated as “Superfund” sites, locations so contaminated that the federal government would intervene to plan, fund, and enforce cleanup efforts. What's happening to our fish? The State of Washington created the Puget Sound Water Quality Authority in 1983 as an advisory body to try to address a wide range of emerging water pollution issues, including the problems of sediments and fish. That body became a permanent state agency in 1985 and, after several transformations, lives on today as the Puget Sound Partnership. [Editor's note: the Puget Sound Partnership is a collaborative partner of the Encyclopedia of Puget Sound.] Government, industry, and community organizations have devoted massive efforts toward cleaning up the sediments and restoring the fish populations to health, and have made progress in many areas. Eventually, Dr. Malins saw that his research program had matured to the point where he could bequeath it to others. Thus, in 1986 he moved to the Pacific Northwest Research Foundation to study the broader topic of DNA damage in relation to the development of human cancers and other abnormalities. He also served as a scientific consultant on various matters, including for the federal government on the impacts of the Exxon Valdez oil spill. He was elected to the National Academy of Sciences in 1995. View fully captioned slideshow on Flickr. Richard Strickland is a retired lecturer at the University of Washington School of Oceanography, and has written extensively about the history and science of the Puget Sound estuary. He is the author of two books, including the Fertile Fjord: Plankton in Puget Sound and Coastal Washington: A Synthesis of Information, published by Washington SeaGrant. View more information at: http://faculty.washington.edu/strix/Strickland.html. Encyclopedia of Puget Sound editorial intern Jake Strickland also contributed to this report. Special thanks to Donald Malins for allowing us access to his archival documents and photos that helped us tell this story. The Puget Sound Voices series and concept was conceived by Randy Shuman, who also contributed to this report. What's happening to our fish? Donald Malins, NOAA Magazine, Mar/Apr 1980.